KIEV, Ukraine -- A year has passed since the start of Ukraine's "Revolution of Honour". 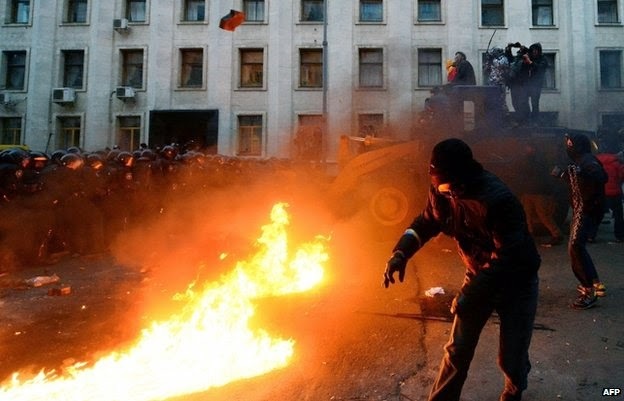 Clashes took place with riot police on 1 December 2013 as 100,000 Ukrainians thronged the centre of Kiev. Nationalist forces inside the Russian Federation, groomed by Russian media for years and flushed with the annexation, took it upon themselves to free the east of Ukraine from the rest of the country. Behind them came Russian military hardware and soldiers, although the Kremlin insists they were not on official army service. Few have tried to analyse the progress of those protests and establish what actually happened. But, after a year, it is time to start making sense of what occurred. This explains why, having later received $15bn of cheap credit and discounted gas, Yanukovych so casually and quickly rejected the opportunity of a European future for Ukraine. I was often reminded of these words after 21 November. First, when not far from the peaceful protests on Independence Square radically-minded participants began building barricades on Hrushevsky Street which leads up to the parliament. It took shape back in 2010 when Yanukovych first became president. That was when he decided to take the entire country under his control, replacing the top and middle echelons of state authority with representatives of the Donbas region, sweeping aside the indigenous elite. He had never studied Ukrainian history and probably did not know that, in 1945, exactly the same policy had been practised by the Communist Party of the Soviet Union. In Western Ukraine, the local elite were replaced by "specialists" from other regions and republics of the USSR. I well understand that, had it not been for the barricades on Hrushevsky Street and the radicals from Right Sector and Svoboda who took up arms against the police who were sent to control them, the revolution would not have succeeded. But dominoes only fall one by one. They cannot raise themselves again. Equally, you cannot rewind history. It is unclear how the current chapter of Ukrainian history will end. I remain optimistic in spite of the pain I feel remembering those who died in the battle for a new Ukraine and those who are still dying and risking their lives on the Donbas frontline. But without the European Union's help, Ukraine will not be able to achieve this. Not because the Ukrainians lack determination, but because beside Ukraine stands a Russia which needs Ukraine to remain as it was under Yanukovych and other presidents - weak, passive and corrupt.